What are the deployment best practices? What are the key metrics that need to be monitored to ensure the application is meeting its required service levels? How will you know when it’s time to add shards? What tools do you have to backup and restore the database? And what about securing access to all that new real-time big data? Is Deploying MongoDB that different from deploying an RDBMS? You’ll find that as a document database, MongoDB shares many of the same concepts, operations, policies, and procedures that you’re already familiar with from the relational world. Processes and best practices for monitoring, indexing, tuning, backups, etc. are applicable to MongoDB. And if you want to jumpstart your training, free online classes from developers and DBAs are available through MongoDB University. System performance and capacity planning are two important topics that should be addressed in any deployment, whether it’s an RDBMS or a NoSQL database. Part of your planning should involve establishing baselines on data volume, system load, performance (throughput and latency), and capacity utilization. These baselines should reflect the workloads you expect the database to perform in production, and they should be revisited periodically as the number of users, application features, performance SLA, or other factors change. Baselines will help you understand when the system is operating as designed, and when issues begin to emerge that may affect the quality of the user experience or other factors critical to the system. The following section discusses key deployment considerations, including hardware, scaling and HA, and discusses what you need to monitor to maintain optimum system performance. When prioritizing hardware budget for MongoDB deployments, RAM should be at or near the top of the list. MongoDB makes extensive use of RAM for low latency database operations. In MongoDB, all data is read and manipulated through memory-mapped files. Reading data from memory is measured in nanoseconds and reading data from disk is measured in milliseconds; and so reading from memory is approximately 100,000 times faster than reading from disk. The set of data and indexes that are accessed most frequently during normal operations is called the working set, which ideally should fit in RAM. It may be the case that the working set represents a fraction of the entire database, such as applications where data related to recent events or popular products is accessed most commonly. Page faults occur when MongoDB attempts to access data that has not been loaded in RAM. If there is free memory then the operating system will locate the page on disk and load it into memory directly. However, if there is no free memory the operating system must write a page that is in memory to disk and then read the requested page into memory. This process will be slower than accessing data that is already in memory. Some operations may inadvertently purge a large percentage of the working set from memory, which adversely affects performance. For example, a query that scans all documents in the database, where the database is larger than the RAM on the server, will cause documents to be read into memory and the working set to be written out to disk. Ensuring you have defined appropriate index coverage for your queries during the schema design phase of the project will minimize the risk of this happening. The MongoDB explain operation can be used to provide information on your query plan and indexes used. A useful output included with MongoDB’s serverStatus command is a workingSet document that provides an estimated size of the MongoDB instance’s working set. Operations teams can track the number of pages accessed by the instance over a given period, and the elapsed time from the oldest to newest document in the working set. By tracking these metrics, it is possible to detect when the working set is approaching current RAM limits and proactively take action to ensure the system is scaled. MongoDB Management Service and mongostat help to monitor memory usage and are discussed in detail below. MongoDB does not require shared storage (e.g., storage area networks). MongoDB can use local attached storage as well as solid state drives (SSDs). Most disk access patterns in MongoDB do not have sequential properties, and as a result, customers may experience substantial performance gains by using SSDs. Good results and strong price to performance have been observed with SATA SSD and with PCI. Commodity SATA spinning drives are comparable to higher cost spinning drives due to the non-sequential access patterns of MongoDB: rather than spending more on expensive spinning drives, that budget may be more effectively spent on more RAM or SSDs. While data files benefit from SSDs, MongoDB’s journal files are good candidates for fast, conventional disks due to their high sequential write profile. Most MongoDB deployments should use RAID-10. RAID-5 and RAID-6 do not provide sufficient performance. RAID-0 provides good write performance, but limited read performance and insufficient fault tolerance. MongoDB’s replica sets (discussed below) allow deployments to provide stronger availability for data, and should be considered with RAID and other factors to meet the desired availability SLA. While your MongoDB system should be designed so that its working set fits in memory, disk I/O is still a key performance consideration. MongoDB regularly flushes writes to disk and commits to the journal, so under heavy write load, the underlying disk subsystem may become overwhelmed. The iostat command can be used to show high disk utilization and excessive queuing for writes. CPU Selection – Speed or Cores? MongoDB performance is typically not CPU-bound. As MongoDB rarely encounters workloads able to leverage large numbers of cores, it is preferable to have servers with faster clock speeds than numerous cores with slower clock speeds. As with any system, measuring CPU utilization is important. If high utilization is observed without other issues such as disk saturation or pagefaults, there may be an unusual issue in the system. For example, a MapReduce job with an infinite loop, or a query that sorts and filters a large number of documents from working set without good index coverage, might cause a spike in CPU without triggering issues in the disk system or pagefaults. Tools for monitoring CPU utilization are discussed below. Scaling your Database – When and How? 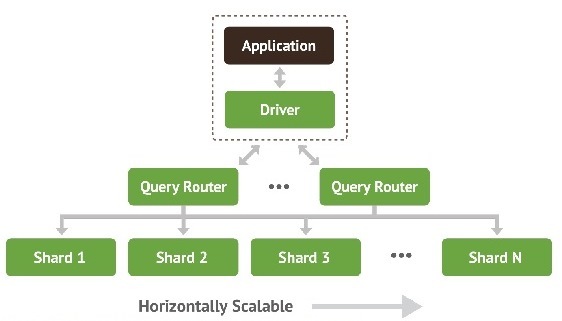 MongoDB provides horizontal scale-out for databases using a technique called sharding. Sharding distributes data across multiple physical partitions called shards. Sharding allows MongoDB deployments to address the hardware limitations of a single server, such as bottlenecks in RAM or disk I/O, without adding complexity to the application. RAM Limitation: The size of the system’s active working set will soon exceed the capacity of the maximum amount of RAM in the system. Disk I/O Limitation: The system has a large amount of write activity, and the operating system cannot write data fast enough to meet demand; and/or I/O bandwidth limits how fast the writes can be flushed to disk. Storage Limitation: The data set approaches or exceeds the storage capacity of a single node in the system. One of the goals of sharding is to uniformly distribute data across multiple servers. If the utilization of server resources is not approximately equal there may be an underlying issue that is problematic for the deployment. For example, a poorly selected shard key can result in uneven data distribution. In this case, most if not all of the queries will be directed to the single mongod that is managing the data. Furthermore, MongoDB may be attempting to redistribute the documents to achieve a more ideal balance across the servers. While redistribution will eventually result in a more desirable distribution of documents, there is substantial work associated with rebalancing the data and this activity itself may interfere with achieving the desired performance SLA. By running db.currentOp() you will be able to determine what work is currently being performed by the cluster, including rebalancing of documents across the shards. In order to ensure data is evenly distributed across all shards in a cluster, it is important to select a good shard key. The MongoDB documentation includes a tutorial on selecting good shard keys. MongoDB uses its native replication to maintain multiple copies of data across replica sets. Replica sets help prevent downtime by detecting failures (server, network, OS or database) and automatically initiating failover. It is recommended that all MongoDB deployments should be configured with replication. Operations that modify a database on the primary are replicated to the secondaries with a log called the oplog. The oplog contains an ordered set of idempotent operations that are replayed on the secondaries. The size of the oplog is configurable and by default 5% of the available free disk space. As illustrated in the figure below, replicas can be located to provide tolerance to server, rack or datacenter failures and network partitions. Replication lag is something to be monitored as part of normal operations. This is the amount of time it takes a write operation on the primary to replicate to a secondary. Some amount of delay is normal, but as replication lag grows, issues may arise. Typical causes of replication lag include network latency or connectivity issues, and disk latencies such as the throughput of the secondaries being inferior to that of the primary. Replication status, including replication lag can be retrieved with the replSetGetStatus command. As part of any deployment, application and database logs should be monitored for errors and other system information. It is important to correlate your application and database logs in order to determine whether activity in the application is ultimately responsible for other issues in the system. For example, a spike in user writes may increase the volume of writes to MongoDB, which in turn may overwhelm the underlying storage system. Without the correlation of application and database logs, it might take more time than necessary to establish that the application is responsible for the increase in writes rather than some process running in MongoDB. MongoDB includes a range of monitoring tools that will enable you to proactively manage the operation and performance of your systems. MongoDB Management Service (MMS) provides cloud monitoring and backup, helping users optimize clusters, troubleshoot performance issues and mitigate operational risk. MMS Backup is discussed in the following article. These metrics are securely reported to MMS where they are processed, aggregated, alerted, and visualized in a browser. Users can easily determine the health of their clusters on a variety of performance metrics. Munin node is an open-source software program that monitors hardware and reports on metrics like disk and RAM usage. MMS can collect this data from Munin node and provide it along with other data available in the MMS dashboard. While each application and deployment is unique, users should create alerts for spikes in disk utilization, major changes in network activity, and increases in average query length/response times. MongoDB provides a profiling capability called the Database Profiler that logs fine-grained information about database operations. The profiler can be enabled to log information for all events or only those events whose duration exceeds a configurable threshold. Profiling data is stored in a capped collection where it can easily be searched for relevant events – it may be easier to query this collection than to try to parse the log files. mongotop is a utility that ships with MongoDB that tracks and reports the current read and write activity of a MongoDB cluster. mongostat is another utility that ships with MongoDB that provides a comprehensive overview of all operations, including counts of updates, inserts, page faults, index misses, and many other important measures of the system health. Linux utilities such as iostat, vmstat, netstat and sar can provide valuable insights into your MongoDB system. For those in a Windows environment, Performance Monitor, a Microsoft Management Console snap-in, is a useful tool for measuring a variety of stats. For more information on monitoring tools and things to monitor, see the Monitoring Database Systems page in the MongoDB documentation. Users should store configuration options in mongod’s configuration file. This allows sysadmins to implement consistent configurations across entire clusters. The configuration files support all options provided as command line options for mongod. Installations and upgrades should be automated through popular tools such as Chef and Puppet, and the MongoDB community provides and maintains example scripts for these tools. The documentation will enable you to learn more about MongoDB configuration options. The latest suggestions on specific configurations for operating systems, file systems, storage devices and other system-related topics are maintained on the MongoDB documentation Production Notes page. In this article, we have discussed how many of the concepts, operations and processes for deploying Relational Databases can be directly applied to MongoDB, along with hardware selection and best practices for deployment and monitoring. Additional detail around all of these topics is available from the MongoDB Operations Guide (opens a .pdf). Mat Keep (@matkeep) is part of the MongoDB product marketing team, responsible for building the vision, positioning and content for MongoDB’s products and services, including the analysis of market trends and customer requirements. Prior to MongoDB, Mat was director of product management at Oracle Corp. with responsibility for the MySQL database in web, telecoms, cloud and big data workloads. This followed a series of sales, business development and analyst / programmer positions with both technology vendors and end-user companies.